Popular place on a Friday night though I don't really see the attaction. Keg Belhaven and Tennants Ember (I think). Everything about it was okay, nothing was good. This isn't a pub for real ale drinkers! It's a small bar with keg Bellhaven Best and one other keg beer. The lounge bar is a little better than the locals' side. Not worth 7/10 in my opinion. called here one lunch time on an Oban day trip, a quiet mid-week afternoon. the pub has a somewhat celtic/irish feel to it. The location and interior have been well described already. a central bar serves a lounge & tap room, as in the photos. no cask ales. the belhaven best is always decent alternative. food is on at certain times. around �7-8 for mains. attractive pub but sadly no cask ales. [no excuse - belhaven do a nice 80/- as cask]. so a 6 from me. 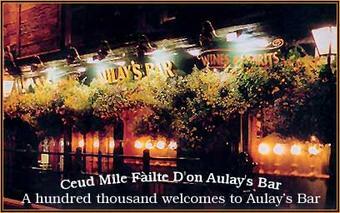 "Aulay's Bar, known simply as Aulay's to the locals, is situated in the centre of Oban, occupying the former site of the towns oldest droving inn, Tigh Clach A' Gheodha or the House of the Creek Stone. Brimming with character, the pub has traditional back to back public and lounge bars. Every inch of wall space is awash with a unique collection of maritime prints showing Oban's seafaring heritage throughout the centuries. "